Imperial Settlers has been one of my favorite games for a long time and Imperial Settlers: Atlanteans just makes a great game even better. Adding a new faction, new marvelous technology tokens and even extra cards for the other four factions. It’s a little box packed full of so many interesting things. Imperial Settlers: Atlanteans is not the first expansion for Imperial Settlers, it’s actually the second (the first was Why Can’t We be Friends, that introduce a new type of “open production” cards). But it is the first “big” expansion for the game. It introduces a lot of new things, chief among them is of course the new faction, the Atleanteans (no big surprise here). The four different factions in the base game are all unique and play differently, thanks to their own unique decks and some special rules. The new Atlantean faction is no different, in fact it’s even more unique that the four other factions. What makes it so unique you might ask? Well first of you’ll lose all your faction buildings at the end of the game, since, as we all know, Atlantis sinks (faction buildings are normally one of the main way to score points for the other four factions). So you’ll need to make the most of them during the game. 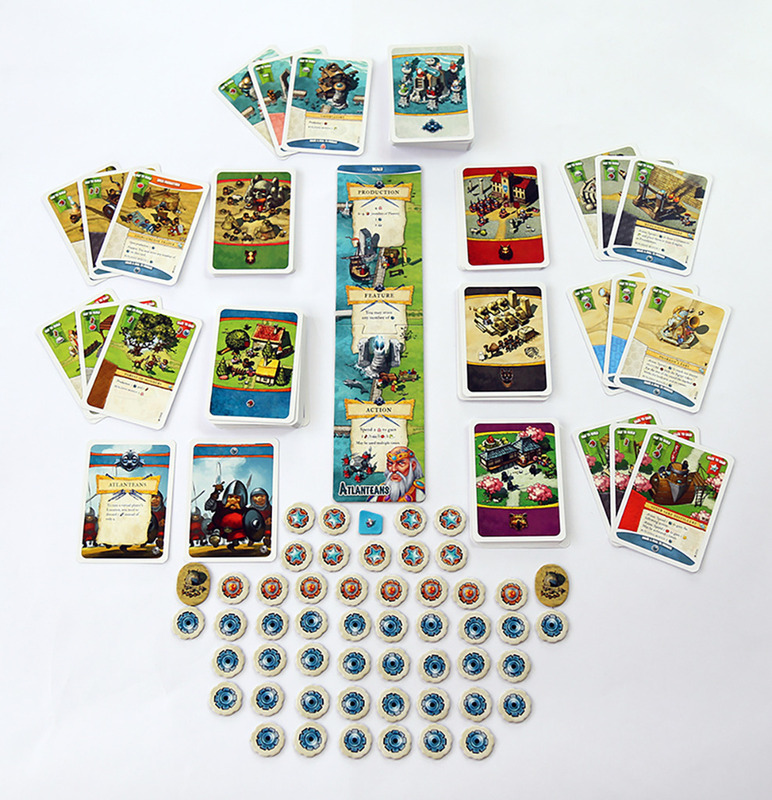 The other major thing that Imperial Settlers: Atlanteans adds is the new technology tokens. These tokens can improve production, score you extra point and add more protection to your vulnerable common buildings. While the Atlantean faction has a lot of focus on these tokens the other factions will also find them very useful. These tokens will be accessible through a lot of the new common cards as well as the 10 extra cards each faction gets. With so many options available to each faction now, constructing your own deck and playing in tournaments has become a real option. 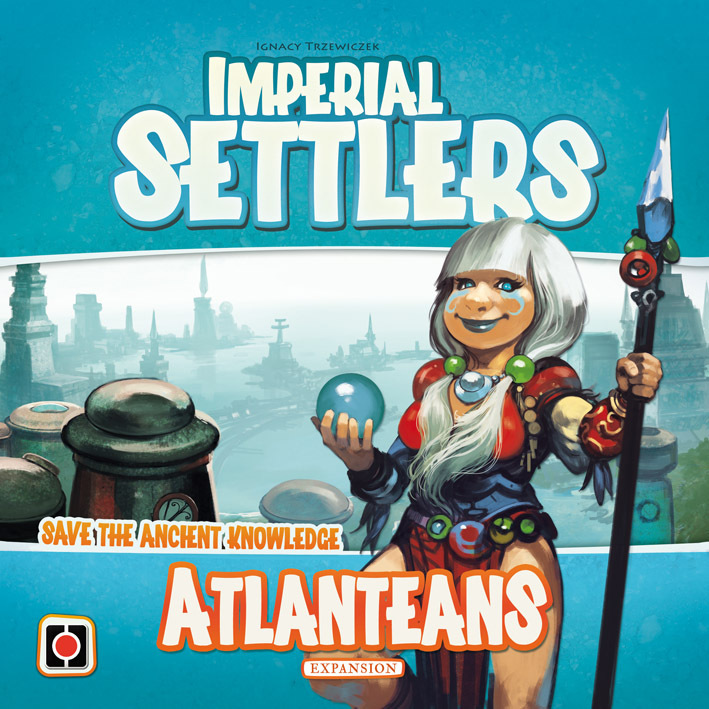 Imperial Settlers: Atlanteans is in my mind as close to a perfect expansion as you can get. You might think this high rating is tied to the high rating of the base game, but it isn’t. If the game would only have added a new faction and nothing more it would still have gotten a high rating. But on top of adding a very well designed and unique 5th faction to the game it also adds a new mechanic in the form of the technology tokens, that will be accessible to all the other factions through the extra common cards and the extra faction cards. With the added extra options to customize your own faction deck player now also have the option to play more competitively against other people in tournaments. I can not recommend this expansion enough, it adds so many new things to an already great game. But if you’ve never played Imperial Settlers I would not get it right away, play with the base game a couple of times first.